Never miss a relevant website update again. 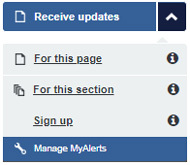 Sign up to MyAlerts - our e-mail and text message service that notifies you whenever content you are interested in is added to or updated on our website. Go to any page on the website and select 'Receive updates' (located near the bottom of the page). For this page - only receive updates for that specific page. For this section - receive updates for all pages within the section. Example: From National 5 Accounting page you select ‘For this page’ - you'll get updates only for National 5 Accounting. If you select ‘For this section’ you'll receive updates for National 5, Higher, Advanced Higher and for the main Accounting page.